A new live DVD is to be released on the 5 June stars Gary Brooker with The Drifters as special guests. 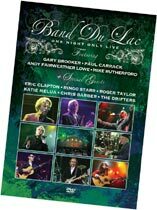 The DVD is entitled ‘Band Du Lac‘ and also features Paul Carrack, Mike Rutherford, Andy Fairweather-Low, Eric Clapton, Ringo Starr, Katie Melua plus many more. The DVD is available to order from the shop by clicking here.